This project opens up new opportunities for the reading, study and appreciation of early modern verse and provides valuable source materials for both literary scholars and historians. We can examine the ways in which public and private spheres were defined through such manuscripts - what is said in manuscript but never printed? 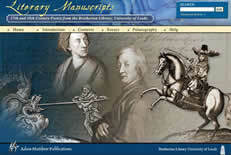 The project combines facsimile images of all of the manuscripts in their entirety, linked to new indexing and to the powerful BCMSV database which lists first lines, last lines, attribution, author, title, date, length, verse form, content, bibliographic references, MS and record number for over 6,600 poems within the collection.